What Is Al Shabab—and What Does It Want? Twenty-nine thousand children under the age of five have died in Somalia in the past 90 days. Nearly 3.6 million people are at risk of starvation. While the crisis has a number of causes—drought, livestock deaths, rising food prices—blame for the worst of the famine lies with the militant Islamist group Al Shabab, which has denied the existence of the famine, diverted water from poor villages, and kept food away from the people who need it most. What is Al Shabab—and what does it want? The answer to that question lies in Somalia’s recent turbulent history. Somalia (which includes the autonomous but unrecognized regions of Somaliland and Puntland) has been a failed state since dictator Mohamed Siad Barre was ousted in 1991. Civil wars and periods of warlord-led rule followed, until the Islamic Courts Union (ICU) rose to power in 2004, bringing a semblance of order—only to be toppled by an Ethiopian-led, U.S.-supported invasion two years later. (Many called this a proxy arm of the war on terrorism). 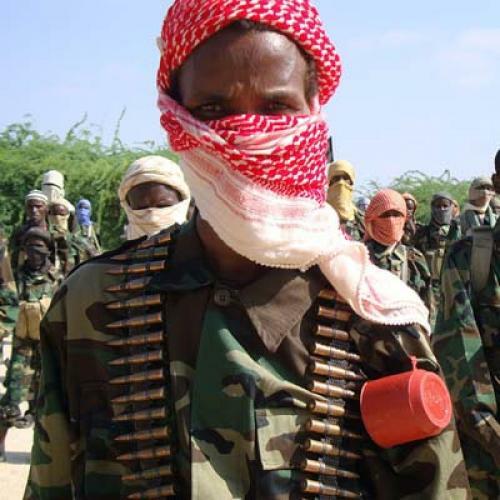 In the past five years, Al Shabab (the full name is Harakat Al Shabab al Mujahideen, orMovement of the Warrior-Youth) became the country’s strongest insurgency against the foreign-backed Transitional Federal Government (TFG). Though TFG is the only authority in Somalia with international recognition, its actual power extends only over a few blocks of the capital city of Mogadishu, retained with the help of an African Union peacekeeping force (AMISOM). Al Shabab—which regularly attacks the TFG and AMISOM in Mogadishu—has been on the U.S. list of foreign terrorist organizations since 2008. More of a consortium than a rigid organization, Al Shabab is led by a small council that directs the several thousand soldiers who make up the group’s core force. Through alliances with local warlords, clan militias, and businesses, the militants have filled the power vacuum throughout southern and central Somalia. Though more concerned with local issues than a global agenda, the group has been strongly influenced by Al Qaeda. The founder, Adan Hashi Farah ‘Ayro, met Osama bin Laden in the mid-’90s, and other Shabab commanders are said to have trained with Al Qaeda. While these ties probably don’t constitute organizational connections, Al Shabab’s reach does extend beyond Somali borders: A recent UN report called them a platform for other radical Muslim groups in East Africa. The recent congressional hearing on domestic radicalization examined the 20-odd Somali-Americans who left Minnesota to join Al Shabab. Last summer, Shabab planted twin bombs in the Ugandan capital Kampala during the World Cup to protest the use of Ugandan troops as peacekeepers in Mogadishu, killing more than 70 people. The organization’s conflicting response to famine relief reflects what Hoogendorn called a growing “friction between hardline jihadi radicals and more pragmatic leaders concerned with the local population.” In July, Al Shabab spokesman Ali Mohammed Rage announced that humanitarian organizations would be allowed in as long as they had “no hidden agenda.” A few days later, he backtracked, criticizing the international community for exaggerating the extent of the food crisis and telling journalists that agencies like the WFP were still banned. Fortunately, the official Shabab line may ultimately have less bearing than decisions of local leaders concerned with the starving populations. The Christian Science Monitor reported this week that Shabab commanders gave UNICEF permission to bring supplies into an airfield they control. At a press conference on Thursday, Hillary Clinton urged Al Shabab to allow food deliveries “unfettered” access into the country; while the words of the U.S. Secretary of State are unlikely to have any influence on Somali militants, the schisms in Al Shabab may prove to be the lifesaver the region needs. Esther Breger is a reporter-researcher at The New Republic.